Synopsis: Viv Albertine used to be in The Slits. This charts her life before, during and after, looking specifically at the three things mentioned in the title. It is an honest and at times emotional journey through one woman’s life. I love The Slits. They are one of my favourite punk bands. 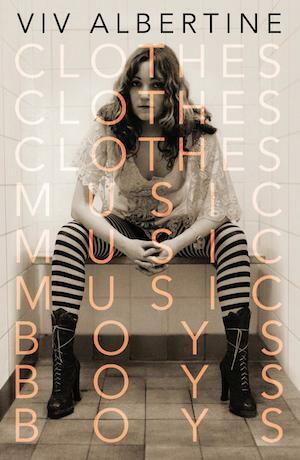 So last year, for my birthday, my husband bought tickets to go and hear Viv Albertine read from Clothes, Clothes, Clothes… and then he bought the book for me. Albertine was entertaining and her life has certainly been interesting but I didn’t completely take to her. I felt similarly when I was reading the book. I’m not entirely sure why but I could never completely relate to her. The book is written with humour and is self-depricating as if all the way through writing, Albertine couldn’t quite believe that anyone would want to read it. She begins with school days, moves through her parents divorce and her entrance into the punk scene then through the domesticity and illness that followed after up to the present day. I found my interest peaked and fell at various points in the book and sometimes I didn’t really want to pick it up at all. It is best – perhaps obviously – when Albertine is talking about the punk scene and her experience with The Slits. Personal descriptions of the stars of the scene – Rotten, McLaren, Thunders, Jones, to name but a few – are all entertaining and added to my understanding of the scene and what it was like for a woman at those times. I was less interested in what came after. I guess that makes me pretty shallow but I would happily have read more about those times and less about her family life. Not that those times didn’t warrant describing. Albertine had early experience of the difficulties of IVF and then discovered she had cancer and her marriage broke down. All of which are described with an emotional honesty it is rare to find. I’m just not very interested in the long fight to have a baby. I have no children and at forty two, it is unlikely I will now. I wouldn’t really choose to read about these experiences if it weren’t for Albertine’s status as punk legend. For me, my interest picked up again towards the end when Albertine starts to perform and record again despite her crippling anxiety about how good she was. It was rewarding to see her confidence build again and she finally seemed happy with her life. There is no doubt that Albertine is a strong woman to have come through all she has and also to be able to be so open about what she perceives as her faults but I still felt at the end as if I hadn’t quite got it, as if I still couldn’t really understand her.